On Friday 3 April, Good Friday, Cardinal Vincent Nichols marked the Lord’s Passion in central London by attending the Walk of Witness in Westminster and the Wintershall Passion play in Trafalgar Square before celebrating the Solemn Liturgy of the Passion at Westminster Cathedral at 3pm. At 12pm, Cardinal Vincent took part in a Walk of Witness with other Christians along Victoria Street, from Methodist Central Hall and Westminster Abbey to Westminster Cathedral. The procession was led by a man carrying a Cross, symbolising Christ’s journey to His death. During the Walk Cardinal Vincent, alongside Canon David Stanton and the Reverend Tony Miles, preached to the assembled crowd who had gathered to join the procession. Cardinal Vincent spoke about the trial of Jesus reflecting on the Scripture read out in front of the Cathedral. He also spoke about how at the end of the trial of Jesus, we should know that He is our rock on which we build our lives; lives that shape our society to strive for the common good, serve others, respect human life and the dignity of the person and recognise that all of our fellow human beings, no matter where they come from, are children of God. After the Walk of Witness, Cardinal Vincent attended the annual Passion Play held in Trafalgar Square performed by the Wintershall Players. At the end of the play, he spoke to the thousands in attendance, thanking them for being part of the dramatic production of the Lord’s Passion and their witness to the life of Christ. At 3pm, the Cardinal celebrated the Solemn Liturgy of the Passion of the Lord in Westminster Cathedral. The Liturgy was concelebrated by the chaplains of Westminster Cathedral and the Apostolic Nuncio, Archbishop Antonio Mennini. In his homily, the Cardinal began by speaking about a vestment that he wore when celebrating the Requiem Mass for King Richard III in Leicester recently. This 600-year old vestment has on its back an ‘exquisite tapestry’ depicting the crucifixion of Jesus with a Roman centurion standing below. The Cardinal explained that this soldier is shown because of a ‘strong legend’ attached to him. This centurion, who pierced the side of Jesus, is said to have been called Longinus and after being splashed the Lord’s blood and water after piercing Him, Longinus was transformed to become a man of peace and a follower of Christ. The Cardinal continued that this afternoon ‘we will see Jesus lifted up before us, raised on the Cross before our eyes’. Also remembering Jesus’ rising from the dead on Easter Sunday and his Ascension to Heaven, Cardinal Vincent said each of these lifting ups shows us our pathway: ‘On the Cross, Jesus shows the way through sorrow and pain and disappointment and even how to approach our death. The lifting up of Him in the Resurrection is the source of our hope, for we know that death is not the last sign but it is transformed into a fuller life beyond. And the lifting up of Him in his Ascension is the promise made to us of our final fulfilment when all that God has made will be brought into His presence, to live the divine “yes”, the divine life for eternity’. He concluded by saying that as we each approach the Cross this afternoon, ‘let us do so in footsteps of Longinus because we too open the wounds on our Lord’s body through our waywardness….We come to be touched by His blood so that we may serve Him, our Lord and Master’. In commemoration of the crucifixion and death of Jesus on Good Friday, the consecration of bread and wine into the Sacrament of the Eucharist does not take place, rather the Body and Blood of Christ, prepared at the Mass of the Lord’s Supper on Maundy Thursday, is used in the service. 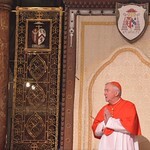 To read the Cardinal's homily in full, click HERE. For photos of Good Friday, please click HERE and HERE.